CND Solar Oil Nail & Cuticle Conditioner, available in .50 oz., 2.3 oz. and 4 oz. refill size. A rejuvenating blend of jojoba, rice bran and sweet almond oils infused with the power of vitamin E. It penetrates deeply into your cuticles and nails to prevent them from becoming brittle and to promote healthy nail growth. 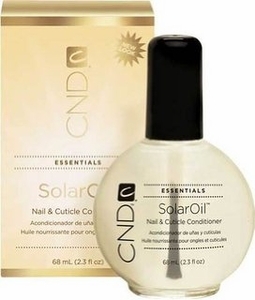 Can be used right over nail polish to soften cuticles and hydrate nails.